Huerta emphasized the importance of education, particularly in the subjects of history and economics, in creating an educated American public. Education can help combat racism by teaching children about aspects of American history are often glossed over, like the oppression of American Indian and African American groups and the labor rights movement — both topics which have had a ripple effect on American society into the present day, she said. The emphasis on women’s studies is just as important, Huerta said. Learning the history of feminism is key to understanding how it paved the way for the roles of women in today’s society and in groundbreaking social movements like the #MeToo movement and Black Lives Matter. Huerta said a record number of women are running for office in United States, and that getting women elected will “change the complexion” of the country. Huerta concluded by encouraging the audience to politically organize and to vote. Her message of activism stuck with members of the audience, who had filled the auditorium nearly to capacity. 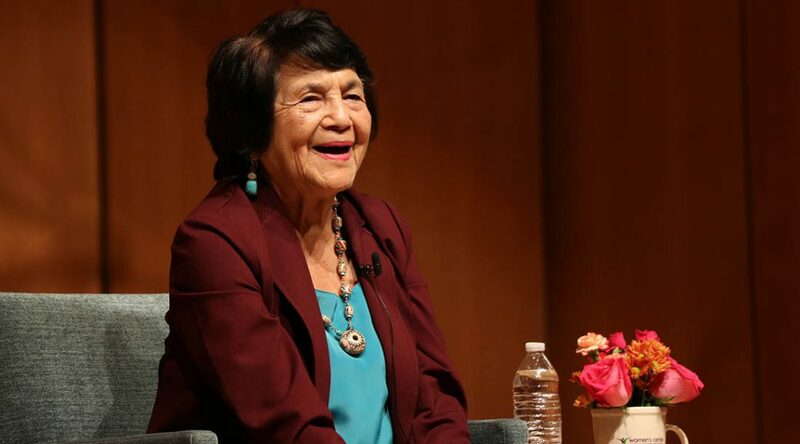 As Huerta finished speaking, the audience erupted in cries of “Sí se puede” — “Yes we can” — a slogan Huerta came up for the United Farm Workers of America. Tatiana Solis, 20, said she had heard Huerta speak at a conference before, but this setting felt more intimate and personal.